You may still be able to book by calling the hotel at 41-22-7157000. 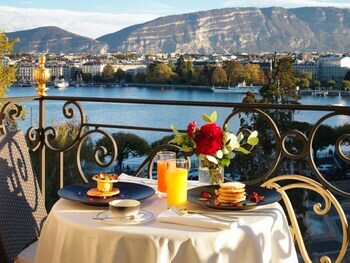 With a rich history that extends back to 1875, Le Richemond isn't any average hotel. It's welcomed guests like Charlie Chaplin, Walt Disney, Louis Armstrong, Henry Kissinger and Michael Jackson, just to name a few. Located in the heart of the Geneva business district, close to Lake Geneva, the hotel is the perfect jumping-off point for exploring all of the city's fabulous attractions and sights. Guest rooms are contemporary and boast a wide array of amenities such as LCD TVs, in-room safes, minibars, Internet connection, heated towel racks and much more. Many rooms also have great views of Brunswick Gardens or Lake Geneva. After you've settled into your room, grab a bite to eat at Le Jardin, the on-site restaurant that serves up Italian cuisine using seasonal ingredients. If you prefer just grabbing a glass of wine, Le Bar is a happening spot, especially on Tuesday though Saturday nights, when live entertainment is offered. 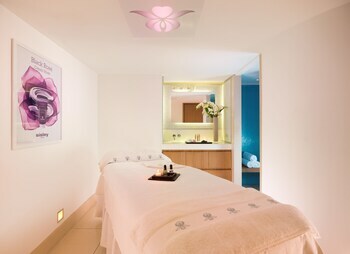 For a Geneva hotel that will sweep you off of your feet, Le Richemond is the place to be.